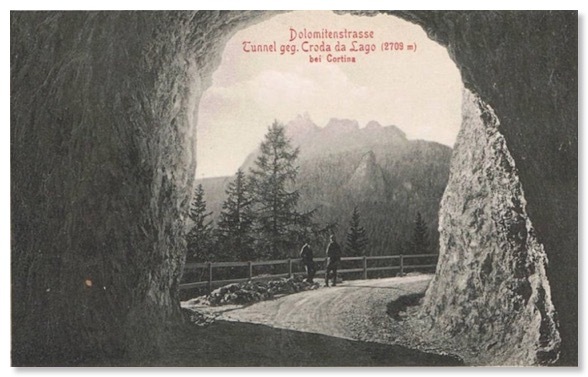 There are two short tunnels high above Cortina on this stretch of the Great Dolomite Road, but only one is on a bend in The Road, so Zardini’s viewpoint was easy to find. It was, however, less easy to photograph. 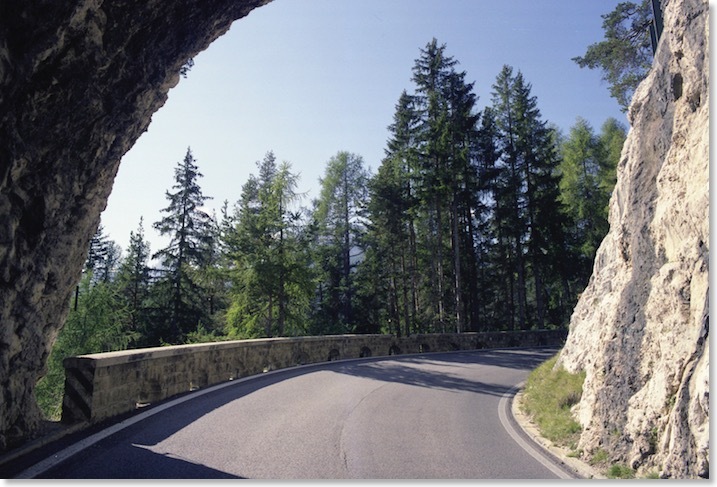 Being a blind bend into a tunnel, it is not the sort of place to set up a camera nowadays! 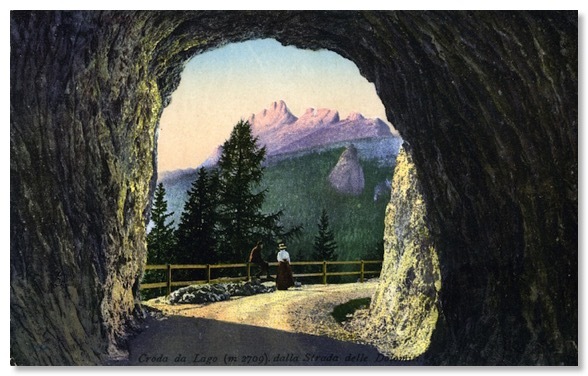 This view looks south east, from the middle of the tunnel (which is no more than 30 metres in length) in the direction of the eastern aspect of the Croda da Lago. See Photo 30 for its west faces. 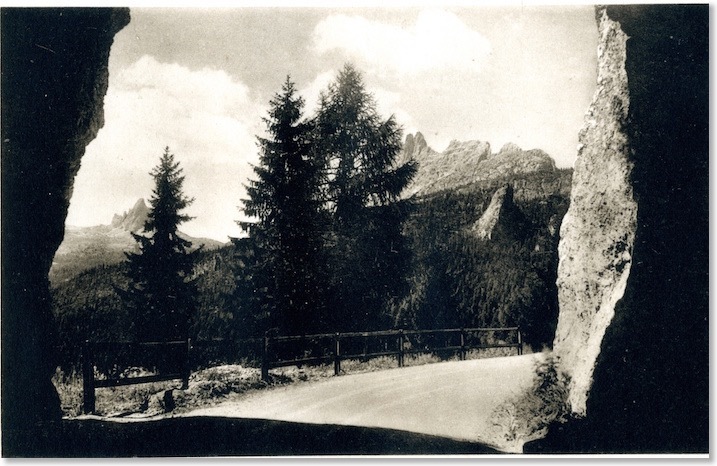 The Becco di Mezzodi is the sharp peak towards the left edge of the Zardini photograph. Even Zardini struggled to get a view around the pine trees, and they have inexorably grown taller in the intervening century. It is, of course, the very same view as that chosen by Zardini. It is credited as having been produced in 1910. Zardini’s own shot post-dates this by however long it took those trees to grow a little further. 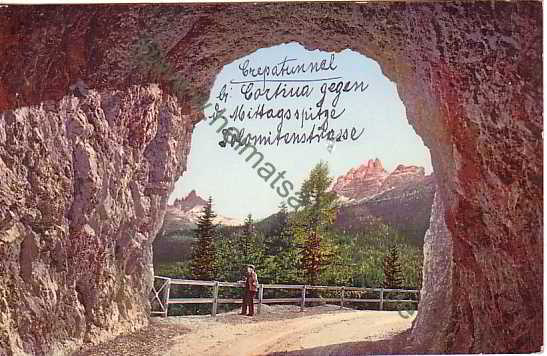 The vagaries of the research material I am drawing on, however, was shown when I found another copy of this postcard for sale online, with a hand-written date of 1949 on the reverse. Such views clearly stayed in print or for sale for many decades! This view , found on-line, may even be slightly older. To labour the point further, this identical view was taken before WW1 by another postcard company. Competition for the views was intense! The viewer will have to take on trust that mine really is the same view today. The shot in this direction does not appear at all in the second of my Zardini booklets.